Whitney Regan never thought she’d flip houses. Nevertheless, the hair-stylist-turned-interior-designer is doing just that. Regan is a design associate at Why Now, LLC. She is also a partner in Your Happily Ever Now, a home staging business. For Regan, no day looks the same. One day she is working on a rental property remodel and the next she is staging a property so it will sell quickly. The Kellam High graduate earned her Associate of Applied Science in Interior Design at Tidewater Community College’s Chesapeake Campus in 2014. Regan chose TCC’s interior design program because it was the only one close to home and it was affordable. She also learned the intangibles – “the business sense we gain that enables us to have the confidence to go out and making a living doing what we love,” she said. 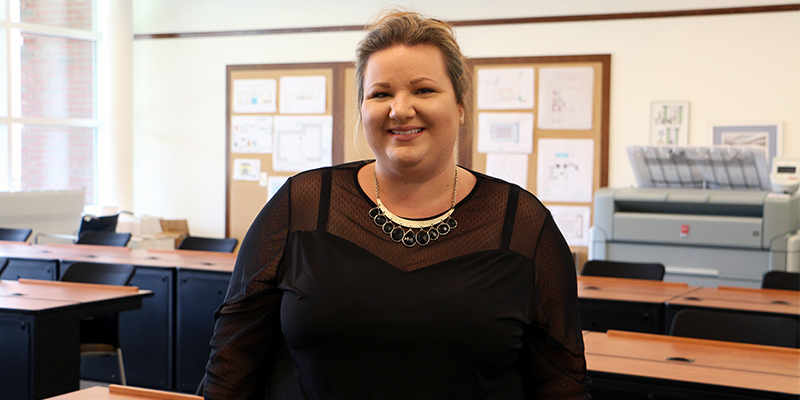 Regan was co-president of TCC’s student chapter of the American Society of Interior Designers. The group planned special projects, including a “Pallet Challenge,” which gave students the opportunity to turn a plain pallet into a design element for the home. She encourages students to build strong bonds with their classmates, as they will become important business contacts. “I’m working with Shontel Feagins who I met in class. She loves drafting, and I don’t, so I hired her to help on a project,” she said. Regan works with TCC professor Lana Sapozhnikov for her home staging business; the pair co-write a blog under the same name. “It started after I served as a juror for a TCC class. Students were asking for feedback on so many areas, that I started writing them down and needed a place to post them,” Regan added. The self-proclaimed homebody hopes to one day build her dream home. “I want to build a spacious ranch home with tall ceilings and tons of light. It will be very sleek and elegant, but also cozy and comfortable. I want a place where my daughter can put down roots,” she said. Regan and husband James have a daughter, Emerson, 3.